If we’re lucky, there is a moment when academic interests merge with our ambitions — when uncertainty falls away and the perfect path forward is revealed, as if it had been waiting there all along. So it was for Kaitlyn Posa, who has been named the 2017 undergraduate recipient of the Marion Luther Brittain Award, the university’s highest student honor. The Brittain Award is presented each year to two graduating students, one graduate and one undergraduate, under provisions of a gift by the late Dr. M. L. Brittain, former president of Georgia Institute of Technology and alumnus of Emory. An interest in medicine first led Posa to Emory. But it was the experiences that grew from that decision that helped nourish a broader interest in the human condition — particularly with regard to international human rights and religious persecution. Once on campus, Posa soon found herself captivated by the university’s commitment to supporting diversity of thought, an intriguing environment for a young woman who’d grown up attending private Catholic schools in Greenville, South Carolina. She eventually decided to pursue a double major in English and psychology. “To me, both are based around understanding other people’s experiences, which is something I’ve been trying to do throughout my life," she says. Posa’s years at Emory have been distinguished by a deep engagement with academic pursuits, campus activities and spiritual life. She has served as president of the Catholic Student Union; as a member of the board of directors of the Aquinas Center of Theology at Emory; and as editor-in-chief for the international affairs journal, the Emory Globe. Through these roles, she strove to “fearlessly unite people across difficult ecumenical and interfaith boundaries,” and shine a light on the importance of religious freedom, says Phillip Thompson, executive director of the Aquinas Center of Theology at Emory, who helped nominate her for the award. Posa graduates this month with plans to attend law school this fall with a focus on studying international law and human rights. The Brittain Award, which comes with $2,500, is presented at the university’s central Commencement ceremony. The Brittain Award is presented to students who are considered to have performed the most “significant, meritorious and devoted service to Emory University, with no expectations of recognition or reward.” Candidates are required to demonstrate strong character, meritorious service and a sense of integrity. Nowhere was that more apparent to Thompson than last year, when Posa independently shouldered the task of creating and implementing a campus panel to discuss religious persecution. The project was inspired by her experiences during a summer internship at Grieboski Global Strategies LLC, a Washington, D.C.-based nonprofit, where she worked with foreign nations and international organizations to improve human rights. “We worked with clients in many countries and identified religious persecution taking place around the world,” recalls Posa. While attending a briefing on Capitol Hill one day, she heard a speaker discuss threats to the Sikh population in India, predicting that the religion could soon be eradicated there. Though she knew little about the religious group at the time, “I thought that it would be an important topic to discuss back at Emory, based upon our social justice goals and the commitment to tolerance that’s espoused here,” she says. During a subsequent brainstorming session with the Aquinas Center of Theology board, Posa suggested bringing together an expert from Washington, D.C., along with local representatives of several religious traditions to discuss the disturbing rise in religious persecution being seen around the globe. One board member was so swayed by her powerful presentation that he agreed to finance the project immediately following the meeting, Thompson recalls. Posa seized responsibility for coordinating the project. “She did all of the exhaustive planning as the creator and organizer of the religious persecution panel,” Thompson says, from selecting panelists from Sikh, Jewish, Catholic and Muslim faiths, to coordinating complex logistics and travel plans, securing a videographer, organizing a dinner for the panelists, and partnering with a number of interfaith entities — both on and off campus. She also managed to secure Elizabeth Cassidy of the U.S. Commission on International Religious Freedom as the plenary speaker. The event, which drew a crowd of about 130, “was timely, evocative, insightful, and well attended by students and faculty alike,” Thompson recalls. Reflecting on what would emerge as a volatile election year, in which religion and immigration emerged as key themes, Posa found the panel discussion especially timely. “It encouraged faiths to come together around an issue that all faiths can relate to, as opposed to focusing on their differences,” she explains. Thompson squarely credits Posa for making it happen. “Her vision, intellect and organizational expertise demonstrated a rare kind of initiative, persistence and passion that combined to create a wonderful new project for our campus," he says. Based upon the project’s success, the Aquinas Center will now host an annual “Consistent Ethic of Life” speaker series — thrilling news for Posa. “I wanted to create something that could be sustainable, continuing on after I’m gone,” she explains. 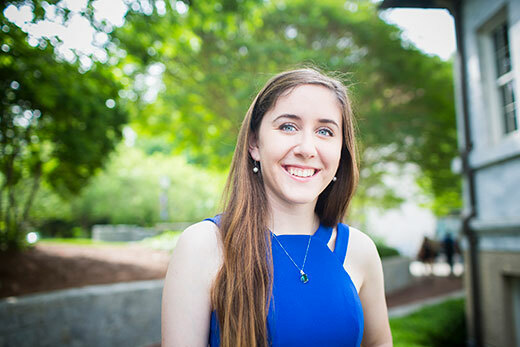 While at Emory, she discovered enriching experiences, relationships and opportunities, from working with Volunteer Emory to serving as a teaching assistant to first-year students enrolled in Health 100. With international affairs as her career goal, Posa will next study international law and continue her work to promote religious freedom and human rights. The Brittain Award will help advance her law school career, she says.